Fit For Life Physical Therapy cares for athletes and active people of all levels. Whether elite, collegiate, scholastic, or beginner, Fit For Life Physical Therapy can help prevent, recover from, or rehabilitate through any athletic injuries. 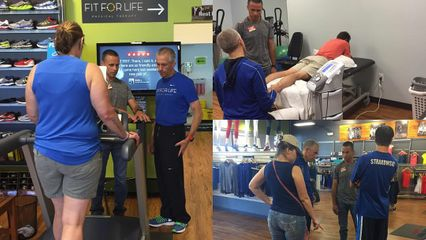 As a 1989 graduate of The Ohio State University, Joe Simko brings more than 26 years of physical therapy and sports medicine experience to Fit For Life Physical Therapy. Joe has a special interest in running biomechanics, injury prevention, foot and ankle injuries, cross country running, and fabricating custom foot orthotics. Before joining FFL, Joe served as the Senior Physical Therapist at both MAX Sports Medicine Center and The Ohio State University Sports Medicine Center, where he specialized in treating running & walking injuries. An avid runner since 1978, Joe has completed more than 20 marathons, qualified for the Boston Marathon 14 consecutive years, and has a marathon PR of 2:45. Frank Haller received his Doctor of Physical Therapy (DPT) from The Ohio State University in 2015. He put himself through seven years of PT school by working at FrontRunner, so he has years of experience in gait analysis and proper shoe fitting for runners and walkers. Frank has an interest in treating the outpatient orthopedic population, with a particular interest in caring for endurance athletes. He has clinical experience in a variety of outpatient settings including the OSU Endurance Medicine program and the Cleveland Clinic.